Home > Pipe & Valve Marking > Pipeline Identification Labels and Tapes > Duct Identification Labels > Fresh Air (with text) Label. 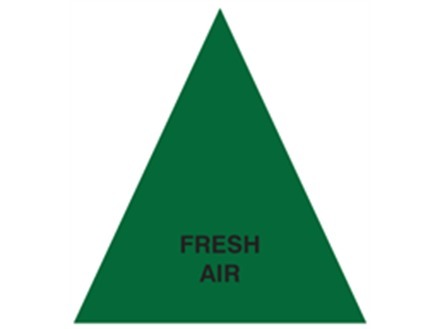 Fresh Air (with text) Label. Items per quantity: Packs of 5 labels. Exhaust Air (with text) Label. 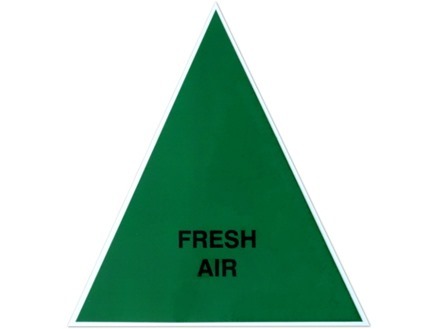 Fresh air (with text) label. Colour coded without text version. Part of our ductwork identification range for air conditioning and ventilation systems. Supplied in packs of 5 labels. Available in 2 sizes. Ductwork identification labels. Fresh air label. Compliant with the Identification of Ventilation Air Conditioning Systems, Supplied in packs of 5 labels. DUC43 Size 100mm x 109mm x 109mm triangle. Material self adhesive vinyl, with clear protective laminate. DUC44 Size 150mm x 164mm x 164mm triangle. Material self adhesive vinyl, with clear protective laminate.